Though we say it ourselves we are quite proud of our Brewers Oak, which has been cleverly designed to mirror a pitch treated floor sanded back to reveal the original oak beneath. Black in tone but light in feel this is a stunning reclaimed style wood floor with a modern, industrial feel and a great choice for rustic inspired interiors. Our Brewers Oak floor is made on our Railway grade oak boards, and features large and small knots, splits and the spectrum of rich natural colour variation characteristic of the finest French Oak. It is fully finished with our durable matt satin hardwax oil, ready to walk on the day it is laid with no further finishing required and available in a choice of widths and generous lengths in Strata engineered oak boards. 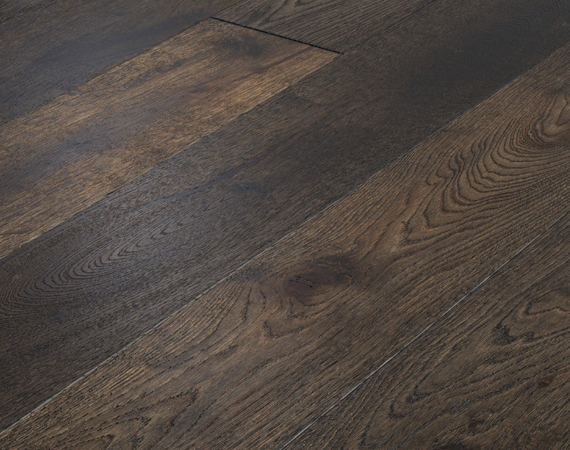 Strata is our award winning, all oak engineered flooring, and offers a whole new level of dimensional stability as well as the coveted resonance and luxury of traditional solid oak boards.